The Book Chook: Let's Celebrate International Literacy Day! Let's Celebrate International Literacy Day! Did you know it's International Literacy Day on September 8? For those of us who value reading and writing with children, it seems to me the perfect opportunity for parents and teachers to celebrate with their kids. Have you ever chatted with your kids about what you value about being able to read and write yourself? Children love to copy the important adults in their lives, so we need to make sure they see us reading and writing. This week (and every week) why not share the books you loved as a child and why, read snippets from the books, magazines and websites that engage you, and encourage your kids/students to do the same with you. * Find a movie based on a book your kids love and watch it together. Popcorn makes an optional extra! * Collaborate over creating a book. Decide on a topic and work out who will do what. Perhaps you might take photos of favourite toys for a caption book, or plan a new story set in a fictional world you both love. There are so many great opportunities for kids to learn this way, and books make precious memories. * Play word games together. Learn a new one or check out some Book Chook Favourites. * Have a game of charades based on book titles. If you're looking for more literacy-based guessing games, check out Literacy-based and Other Guessing Games. * Find a great book in your local library and share it as a family read-aloud each night. Or start a class serial. * Work out something the kids would like to make - build, craft, sew, cook - and find directions for how to do it in the library or online. * Do a crossword together. With older kids, teach them how to do cryptic crosswords. * Build a reading hut from a cardboard box and read all your old favourite stories inside. Change it up and make a reading tunnel! * Tell kids that all of this week, bedtime is extended. They're allowed to read under the bedcovers by torchlight for an extra fifteen minutes. * Skip a scheduled lesson and re-visit the kids' favourite books or poems. You know you want to! * Create a comic online. If you need some suggestions, grab my free PDF, Using Comic Editors with Kids. * Read your favourite poem backwards or upside down. * Write a message in code for a friend. * Raid your dress-up box and act out scenes from your favourite books. * Pack up the books you've out-grown, and give them to someone who could use them. The gift of reading lasts a lifetime! Find more ideas for celebrating literacy and learning with kids via the Celebrating button in the right sidebar. Thanks for the tip. Your blog is a breath of fresh air ! 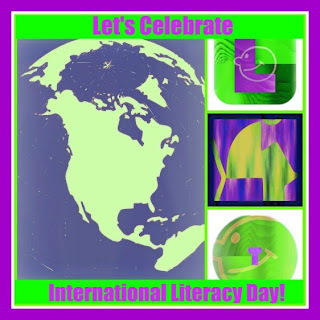 I will write about "International Literacy Day (September 8th) on next weeks blog post.